The book of Soderbergh's epic movie "Che," featuring a selection from Che's diaries, as well as his fiery speech at the United Nations, New York, in December 1964. 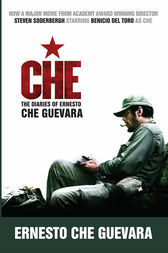 With an extensive biographical chronology, this book shows the young Argentine's evolution from the wide-eyed medical student of "The Motorcycle Diaries" era to the revolutionary hero the world knows as Che. One of Time magazine's "icons of the century, " Ernesto Che Guevara was born in Argentina and studied medicine. After meeting Fidel Castro in Mexico, he joined the revolutionary forces that overthrew the Batista dictatorship in Cuba. He later led guerrilla missions to Africa and Bolivia, where he was killed by CIA-backed forces.